This week: Halloween is on a Friday so it’s more than likely that you might be a little hungover from the night before. Tough cookie, man. We’re playing Run the Jewels 2 until no one else can stand it anymore. At maximum volume. With air guitar. Go get some aspirin and park your rear in a chair. This is going to be a looooooong Saturday. Florida State comes to Louisville to play one of the toughest defenses they have ever seen this season. Football Outsiders’ F+/ currently ranks the Cardinals as the best defensive unit in the country. All of which isn’t good news for a Seminole offense who, while still very good, have had to come from behind against NC State, Notre Dame and Oklahoma State. With a pending investigation by the social media savvy Tallahassee PD, it remains to be seen whether or not FSU RB Karlos Williams will play in the game. A suspension could prove worrisome for an offense that needs all of its firepower against Louisville. No. 2 Florida State kicks off against No. 25 Louisville on Thursday at 7:30 on ESPN. Even without Todd Gurley, Georgia is going to roll against Florida. The Bulldogs are the most complete and consistent team in the SEC East besides a giant exception in a road loss to South Carolina. Nick Chubb has been putting up monstrous rushing yards in abscence of UGA’s most high-profile runner. This match is watchable as it marks the end of the Muschamp era at Florida in this rivalry. Next year, Georgia has the pleasure of facing a new hire which has been rumored to be everyone from Rich Rodriguez to Steve Spurrier. This Saturday though is a memorial to the Coach Boom years in Gainesville. The World’s Largest Cocktail Party begins at 3:30 on CBS. West Virginia is playing unbelievably skilled offense – a similarity it shares with this weekend’s opponent, TCU. The Horned Frogs have been a surprise this year as they boast a remarkable turnaround with a 7-1 record. QB Trevone Boykin has started to build a late case for the Heisman trophy with 2,306 yards and 21 touchdowns through seven games with yards per attempt of 8.06. Boykin has to face off against Mountaineer Clint Trickett, who has himself a resume that is just as solid with a completion rating of 68.3%. Expect a high scoring affair that comes down to who has the better defense. A TCU loss here means elimination from playoff contention while a West Virginia win is a step toward the Mountaineers lifting the Big 12 trophy. No. 7 TCU and No. 20 West Virginia kick off in Morgantown at 3:30 on ABC. Auburn and Ole Miss are on a wobbly plateau that threatens to push one of them into a pit of other teams who have two losses. The Rebels’ loss came at the hands of a run-happy, crowd friendly LSU while Auburn fell at the hands of Dak Prescott making the best of Tiger turnovers. Transitive property suggests that Auburn’s huge blowout win over LSU translates to a stomping of Ole Miss. The loss of Denzel Nkemdiche for the Rebels could also point to an Auburn advantage. Despite the LSU game though, the Rebels remain the best team out of the two in the F+/ combined rankings. Also, did I mention this game is in Oxford? Broadcast starts at 7:00 on ESPN for the game between No. 3 Auburn against No. 4 Ole Miss. Mississippi State is a team rumbling their way into the postseason as the only undefeated SEC West team. On Saturday, they visit Arkansas to take on one of the weaker teams within the division. Weakness as defined in this case is the number in the loss column. The Razorbacks have been itching for an upset ever since the 14-13 loss to Alabama that made Nick Saban spit fire. Yet, the numbers look miserable for Arkansas who have a -4 turnover margin at home compared to 1 when on the road or at a neutral site. They also have a dismal 40% 3rd down conversion rate when facing AP ranked opponents. All of this is terrible news for a run first team facing a top 25 run defense. Still, the trap god has been known to abide from time to time. No. 1 Mississippi State and Arkansas starts at 7:15 on ESPN2. Stanford’s offense is a tire fire in the red zone. This year the Cardinal are the 122nd team in red zone scoring. Everytime they have been inside the 20 yard line they have only scored 67.86% of the time. This is down by over 20 percentage points from last year. The significant drop can be explained by a very young offensive line. QB Kevin Hogan has been sacked 15 times this season and has yet to face Utah and UCLA. The cure for this is Oregon’s Don Pellum coached defense. Through eight games this season, Oregon has allowed opponents to score 85.71% of the time they are in the red zone. Great news for a Cardinal team whose defense is traditionally responsible for rendering the Ducks’ offensive game plan obsolete. The Cardinal visit Autzen Stadium at 7:30 on FOX. Kansas State, at the moment, is a playoff contender. Does that mean the aforementioned statement holds true at the end of the 2014 season? Probably not. It’s nice to sit and watch the Big 12 burn though. The Wildcats – along with West Virginia and TCU – are part of a pecking order that is switching top spots week in and week out. This week, Kansas State plays Oklahoma State at home. The bad news is that QB Jake Waters has banged up his shoulder in the team’s shutout against Texas. The good news is that the Cowboys’ turnover margin is -3 against ranked opponents. A stat padded with the results from West Virginia’s destruction of Oklahoma State’s offense. Kick off starts at 8:00 on ABC. The Fighting Irish are eyeing a coveted spot within the hallowed playoff with an optimistic smirk. For Notre Dame, the spot is entirely attainable should they win out for the rest of the season. Their independent schedule allows them to lay claim to tough SOS with a signature win over Stanford. However, some wins look more terrible than the four point loss they received at the hands of Florida State. After their bye week, the Irish travel to Navy to face an unorthodox rushing attack that made Ohio State’s defense suffer for four quarters until the offense pulled away. Notre Dame may have some problems here but it will be interesting to see if Navy can throw them off balance. Yes, you’re reading this correctly: No. 10 Notre Dame and Navy play at 8:00 on CBS. In the Pac 12, Cal is the thread of which most teams are connected. Some have beaten Cal convincingly while others, like the two opponents here, came within a hair of falling to Sonny Dykes’ Bear Raid. 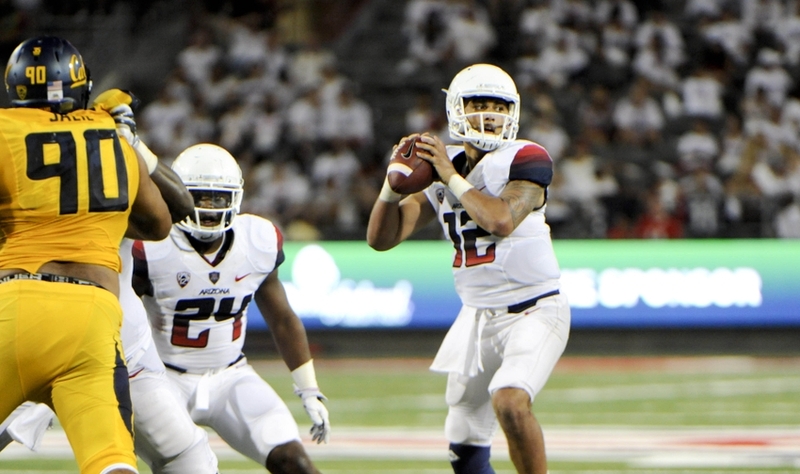 Arizona and UCLA meet in Los Angeles for a battle to firm up the Pac 12 South picture. The Bruins look in trouble as they face as a Wildcat team that is averaging 348.4 passing yards per game, per CBS Sports. UCLA is giving up 267.8 passing yards per game which puts them at the 100th best pass defense in the FBS. Arizona has the better offensive statistics but they have a defense that is giving up a total of 447.80 yards per game. We could find ourselves in another hail mary situation which has become the modus operandi of how the Pac 12 ends at night. This division bout starts at 10:30 on ESPN. The Sun Devils are currently 1st in the Pac 12 South. A win over Utah solidifies their place in the division race and separates them from the likes of UCLA and Arizona. The Utes are tasked with stopping an offense that is 18th in passing offense on the arm of Taylor Kelly, with some assistance from Mike Bercovici . However, their passing defense is atrocious allowing 264.7 yards per game. Utah does have an advantage with the loss of ASU’s redshirt junior guard Christian Westerman. The Utes are 19th in run defense and the loss of a key interior lineman ensures an even greater one dimensional team than one that already stands. No. 17 Utah enters No. 14 Arizona State’s Valley of the Sun at 11:00 (!!!) on Fox Sports 1.